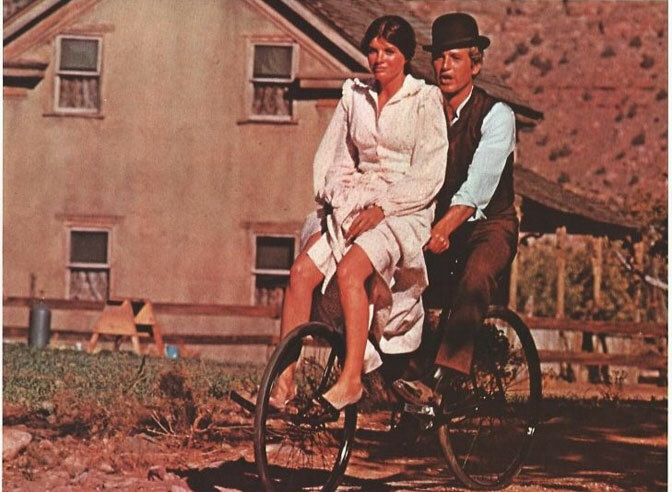 Paul Newman and Katharine Ross in the movie Butch Cassidy and the Sundance Kid in 1969. Picture was taken in front of the Russell Home in Grafton. 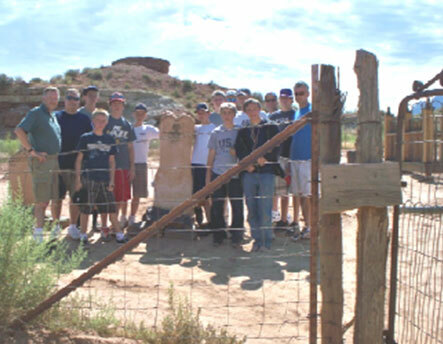 In July, David G. Russell who is the great great grandson of Alonzo and Louisa Foster Russell brought his son and the Varsity Scout Troop 7360 from Bluffdale,Utah to cleanup the Grafton cemetery. 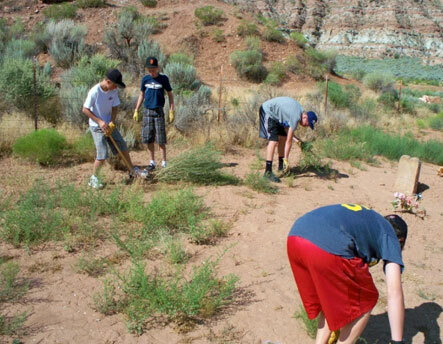 There were ten 14-16 year olds and five dads. The Virgin River forms Grafton’s northern boundary. The river tells an important natural history, especially as it relates to the town’s human history. It was the river that both gave life to and drove residents away from Grafton. In December, the river flooded sections of pastures in Grafton leaving about 3 feet of sand. The flood tore down fences next to the river that needed to be repaired. The river also took over the field the Grafton Heritage Partnership owns on Highway 9. Now, when the water level is high the river runs down the middle of field. The schoolhouse and other remaining buildings are up on a terrace and safe from flooding. The river came to bottom of that terrace. Due to the damage from flooding Rockville’s residents that lived along the river requested the banks of the river be armored with rocks to protect their homes. Because it was declared a state and federal emergency the river banks in three areas were armored. County officials felt the terrace at Grafton did not need to be armored. A chimney on the Russell home collapsed and needed to be replaced. Descendants of Grafton will hold their annual Grafton Reunion, September 24th, 2011 at the Grafton town site from 12-2:00 PM. Everyone is welcome. Bring your lunch, hat and chair and memories to share. 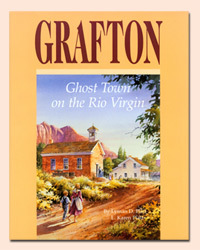 We will have a display of historic Grafton pictures in the schoolhouse. The Grafton Heritage Partnership will have items to sell to raise funds for the Grafton Project such as books, pictures of Grafton and t-shirts. There will be a program and if you have any stories you would like to tell about Grafton or a song to sing, let us know and we will put you on the program. We realize the vision of preserving Grafton’s buildings and landscape cannot be accomplished overnight, but requires our ongoing oversight and maintenance. Your donation allows us to move with our on going restoration plans for Grafton. Donations are gratefully received and tax deductible. You can donate with a credit card on our secure web page www.graftonheritage.org, Click on support us. There is a donation box at Grafton’s gate.